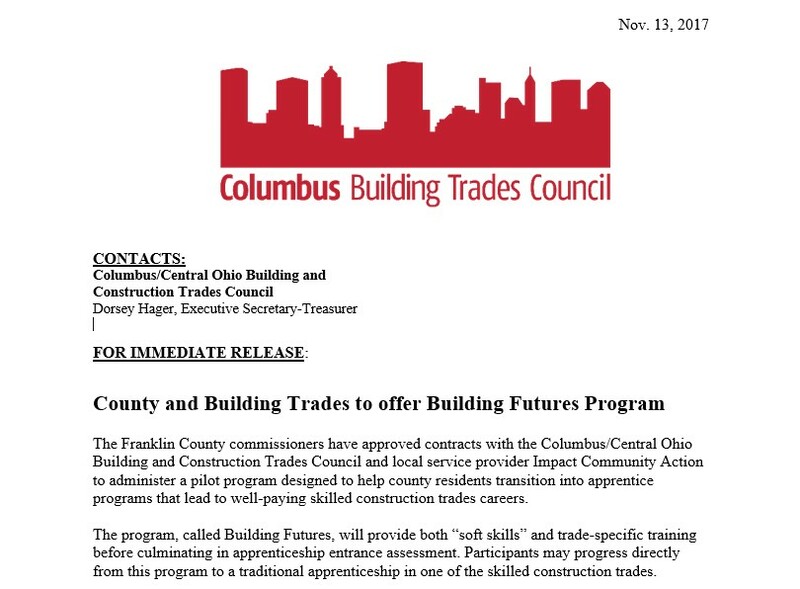 The Franklin County commissioners have approved contracts with the Columbus/Central Ohio Building and Construction Trades Council and local service provider Impact Community Action to administer a pilot program designed to help county residents transition into apprentice programs that lead to well-paying skilled construction trades careers. The program, called Building Futures, will provide both “soft skills” and trade-specific training before culminating in apprenticeship entrance assessment. Participants may progress directly from this program to a traditional apprenticeship in one of the skilled construction trades. Twenty-five students are expected to take part in the pilot class, which kicks off at the end of November. Building Futures’ participants will begin with three weeks of “soft skills” training, such as skills assessments, teamwork and interpersonal skills training and financial literacy curriculum to be provided by Impact Community Action. Participants will be paid $250 per week for their time during this period. The next six weeks of Building Futures will focus on hard skills, including safety certification, construction-specific literacy and math, and trade-specific literacy and math instruction, which will be provided by the Columbus/Central Ohio Building and Construction Trades Council. The entire program will seek to be recognized by the Ohio State Apprentice Council and will encompass more than 100 hours of training during nine evening weeks. In addition to the skills assessment and training, participants will receive mentoring and Comprehensive Case Management services provided by the commissioners’ Job and Family Services Department, which will also administer the program for the county. Four classes of 25 students each are expected to participate over the next year, for which the county has set aside $750,000. Resolutions celebrating National Apprentice Week and approval of the Building Futures Program will be voted upon at the next County Commissioners meeting on Nov. 14 at 9:30 a.m., located at 373 South High Street on the 26th floor.